Are you a dog lover? Me too! You will love this tri-blend fabric that creates a vintage, fitted look. And extreme durability makes this t-shirt withstand repeated washings and still remain super comfortable. Question: I love this shirt but want it in a different font- Can this be done? Anwser: Of Course! Let me know what your thinking and i can make it! 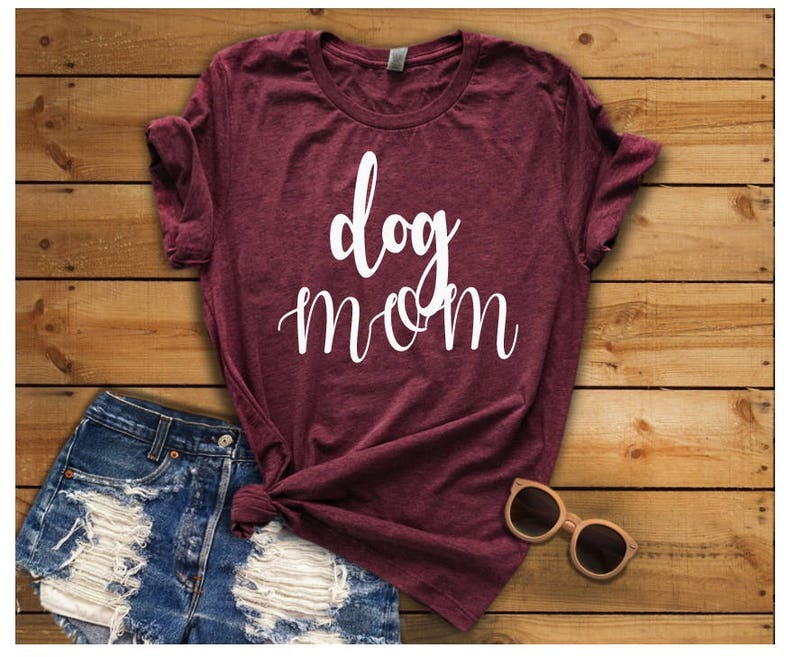 Question: I have a Beagle- Can I have this shirt say something about being a Beagle mom? Anwser: YES! Anything you want it to say i can do it ! Question: Can I Get One Adult Shirt and one Kids Shirt? Question: All I See Are Men's Shirts How Do I Order a Ladies? Answer: These are actually Unisex shirts. I've gotten ALOT of great comments on the sizes. I can switch this out for one of the ladies shirts however, these shirts tend to run EXTREMLY small. I would measure something in your closet and match it up to the size charts listed on the PB&J listing. Question: How is the sizing of these shirts? Do they fit true to size? Answer: These are actually unisex shirts. For ladies they are a nice comfy looser fit. The sleeves and torso will be a little longer then normal as well. A lot of ladies like to roll up the sleeves for a more feminine look and some like to put the knot in the side. There is also a size chart for each item. If for whatever reason you don't see the size charts and you need them please let me know! Question: How Long Does This Take To Receive? Answer: Processing is 2-7 Business Days and Shipping is 7-8 business days. Question: Can I get Faster Shipping? Answer: YES- The 2nd listing on my shop. You will need to add this into your cart as well as your items. This will get you overnight shipping ( or 2 day shipping) + get you at the top of my list. Question: What's the name of the color on the main listing here? Question: I don't see the color I need on your drop down box... how do I get this in another color? Answer: Just choose any color then put in the notes what your looking for. I look at all notes before starting on each item. If for some reason the color you put in the notes is sold out at that time I will contact you. If you have any other questions please let me know! Any other questions please let me know! Im her to help! I love this shirt. It fits nicely and is SO SOFT!!! Love the quality and feel of the shirt! A great gift! I gave it as a Christmas gift and my sister in law loved it! Great purchase! Fits true to size . The Robbins Nest provides sizing charts for every item. If you do not see the size chart for your item be sure to message me. We offer custom orders! Anything you want we can make it! Messge me what your looking for and ill send you a mockup of what it will look like before you purchse. Processing is 2-7 Business Days - Shipping is 7-8 Business Days. With that being said I normally get your order out a lot quicker then that. There is also the option to upgrade your shipping to "Overnight Shipping" This also puts you at the top of my list.